Todd’s spider-sense is tingling like crazy. 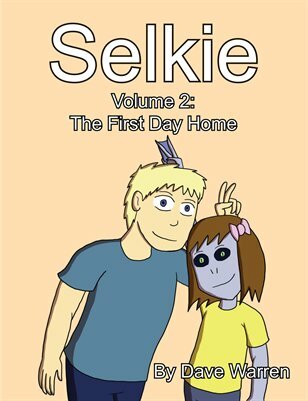 Just a quick announcement, I’ve been working to compile the first 50-ish strips into an ebook form, for those that want to have Selkie on-the-go. I should have it up in the Selkie Store by the end of the week, but was curious what formats any interested parties would like to have. The version available on the website will probably be a PDF, but I am also looking into the steps to sell it through the Kindle and iStore options. So, aside from PDF Kindle and iStore, what other ebook formats would you want/like? Selkie's screeching capacity was referenced briefly back in strip 236 (https://selkiecomic.com/selkie236/). My background philosophy for the screeching is that Selkie will use it in anger or for effect (to scare or intimidate for example), but on some social-awareness level, Selkie knows that humans don't screech, so screeching makes her look less human. Oh boy, that does NOT sound good. Really hope George is ok.
I’d recommend working extra hard on the .pdf file, if you do it right, you can import it into the lulu books website and offer a print on demand service, people can either buy a digital copy of the .pdf file or print off a hard copy if they wanted it. I hadn’t considered the Print on Demand option. I’ll have to check into it. Try Createspace, by Amazon. Print on demand, availability on Amazon’s website, and Kindle support. I use it, I’m on my seventh book now. *laughs helplessly* Then again, Selkie is acting like a normal child her age, and definitely likes her home well enough to feel a bit territorial there. See what it takes to get it into Comixology. It’s optimized for graphic novels and comics. PDF works for me. I have a Nook Color. I would love love love to have an EPUB or MOBI. PDFs aren’t easily converted into those formats, but EPUB and MOBI are pretty easy to transfer back and forth, in my experience with Calibre. It always worked for me. So if she does that screech underwater, can it perhaps stun fleeing prey? My guess was that Georgie fell over in surprise and banged his head on something. A physical book to hold in my hands please. You might find https://gumroad.com/ helpful in selling/distributing PDFs. I know people who’ve used it and been very happy with them. Can’t visualize the screeching. Can you name an animal screech it sounds like so I can imagine it better? I’m gonna just say… I’m reminded of the Nazgul from LoTR. That scream they do, that paralyzes some people? Yeah. Kinda the vibe I’m getting here. That’s exactly how I envisioned it, too. Based on some animal call research I did on Youtube, I’m now picturing a gecko scream. Seems like Selkie’s attempts to get even may have gone too far. If you publish only in the EPUB format, then of the 25+ free ebook-reader programs for Android that I’ve tested, there’s only one that CAN’T read it: Kindle. There are no other MAJOR formats for ebooks. If *you* publish only in MS Word, you can upload the document to the Smashwords website. Their software will take that document, convert it to EPUB, and publish it. They take a cut of the selling price (their cut of $0 is $0) and send you the remainder. If your document meets certain standards, they’ll also send your book to Barnes&Noble. Get, read, and follow their style guide; it’s on their site and free – and though your book is primarily pictures, it actually will have a fair amount of text on the title page, copyright-notice page, etc., and the style guide covers those pages in detail. Also, there is probably a “printer” driver for your OS – there definitely are several of them for Windows – that outputs whatever you print to a file in PDF format. So it pretty much doesn’t matter what you use to prepare the document, it’s easy to produce an adequate (not necessarily full-featured) PDF file of it. Also, if you want to produce for iOS and have a Mac, you can get (free) iBooks Author, which is fabulous for doing layouts and image-based files. I like the suggestions of warrl and Jarman. I don’t have anything that would let me really access an ebook but something that has a print on demand or a way to get a hardcopy version without you (the author) having to put a lot of cash out there would be great. I’d even go so far as to say that I would purchase copies to give as gifts if the price was reasonable. I wonder if George is about to vomit. Sounds like Selkie needs to hook up with the Goth or Metal/Death Metal crowd. Her screeching will be the envy and might give her an outlet for her anger issues. Best format for e-comics: CBR/CBZ. Take the images, put them in a .ZIP or .RAR file, changing the extension to .CBR (for .RAR files) or .CBZ (for .ZIP files). There are a number of free comic-reading programs which open them and display them. MUCH better than .PDF, which constantly gets in the way of reading comics. I would second the motion for CBR/CBZ, it is the basis for what Comixology does, which adds layout information and lets you do panel-to-panel jumps. One strip ago, I was right.